If you've ever seen a horsedrawn Budweiser parade, you've marveled at the majestic, enormous steeds pulling the wagons. These are the mighty Clydesdale horses—the most recognizable and well known of all the heavy horse breeds. The Clydesdale was developed in Scotland during the late 18th and early 19th centuries in what is now known as the Lanarkshire district. The River Clyde flows through the area and gave the Clydesdale its name. Clydesdales first arrived in North America when Scottish settlers brought them to Canada. In the late 1880s, the regal horses were introduced in the U.S., where they were used to plow fields, power machinery, pull wagons, and perform other tasks that required their formidable strength and endurance. As machinery began to replace heavy horses in industry and agriculture—rendering true horsepower needless—Clydesdales came very near to extinction. Their conscription in World War I also contributed to the population's decline. Nowadays, the horse's breeders and enthusiasts work to ensure the survival of the breed. While the Clydesdale's numbers have rebounded somewhat, they are still listed as an "at risk" breed in Canada, with fewer than 500 registered horses in the country. Likewise, the U.K.'s Rare Breeds Trust includes them on its rare breeds list, despite the horses' once numbering 140,000 at their peak. The largest numbers of Clydesdales are found in the U.S., where about 600 additional horses are registered each year. The U.K., Canada, and Australia follow the U.S. in this breed's population. While no absolute breed standard exists, owners and judges look for a short-backed, broad-chested stance with a well-sprung barrel. The head should have a flat profile and large, bright eyes, while the neck should be long and arched. The horse should give the overall impression of power and strength without being rangy or loose-jointed. Clydesdales tend to be leggier than many draft-horse breeds. Clydesdales are among the tallest of breeds, standing more than 16 hands high. Their imposing height is matched by their weight, which tops 1,600 pounds—the approximate weight of a Volkswagen Beetle. Clydesdales towering more than 18 hands high and weighing more than a ton are not unusual. They usually live 20 to 25 years. The Clydesdale was developed to work hard and long, performing tasks in agriculture, industry, and commercial transportation. In their early history, they were used as war horses, suited to carrying heavily armed soldiers. They have pulled agricultural implements, hauled logs in forestry, pulled freight and milk wagons, and performed other general hauling tasks. Today they are used for both riding and driving, and they are frequently crossbred with Thoroughbreds to develop strong, level-headed sports horses. They are still occasionally used in agriculture work and logging, but they have largely been replaced by machinery such as tractors. They're frequently seen in shows at regional fairs and national exhibitions. With their calmness, agility, and strength, they make excellent trail horses as well. Those same traits make them valuable as therapy horses; some disabled people learn to walk again by sensing the horse's movements. Clydesdales frequently serve as drum horses in parades. Each horse carries two drums that weigh more than 120 pounds apiece, along with the officer who rides. Clydesdales selected for this purpose must be at least 17 hands high (68 inches tall) and are often piebald, skewbald, roan, or otherwise striking in appearance. Clydesdales are most often bay in color but can be black, gray, or chestnut. Their coats can be solid or have some roan markings or spots. White stockings on the legs are common, but solid colors occur as well. They often have wide white blazes or bald facial markings, resulting in flashy, eye-catching combinations. Bay and black horses frequently command a premium, particularly when they sport white markings on the face and the familiar white stockings. Roans tend to be least preferred, but breed associations make no such distinction; no colors at all are undesirable, in their view, and they readily accept horses with body spots. The most obvious characteristic is their large hooves—typically the size of frying pans and weighing around five pounds each (in contrast, an average Thoroughbred racing horse has a hoof about a quarter of that size). Many Clydesdales have flashy coloring, with white facial markings and four white legs, with lots of feathering. They are high-stepping at both the walk and the trot, giving them a proud, impressive presentation. Most people know the Budweiser/Anheuser-Busch Clydesdales, of course. Currently, several teams tour throughout North America. The sight of a rumbling wagon weighing several tons, pulled by an eight-horse Clydesdale hitch in gleaming harness, is unforgettable. The first team was formed in the 1930s, and they have made appearances at many public events. Records of Clydesdales have been maintained all the way back to the early 1800s. The lineage of one filly born in 1806 could be traced back to a large black stallion that had been bred from a large Flemish stallion and a Scottish mare—and nearly every Clydesdale alive bears that filly's genes. 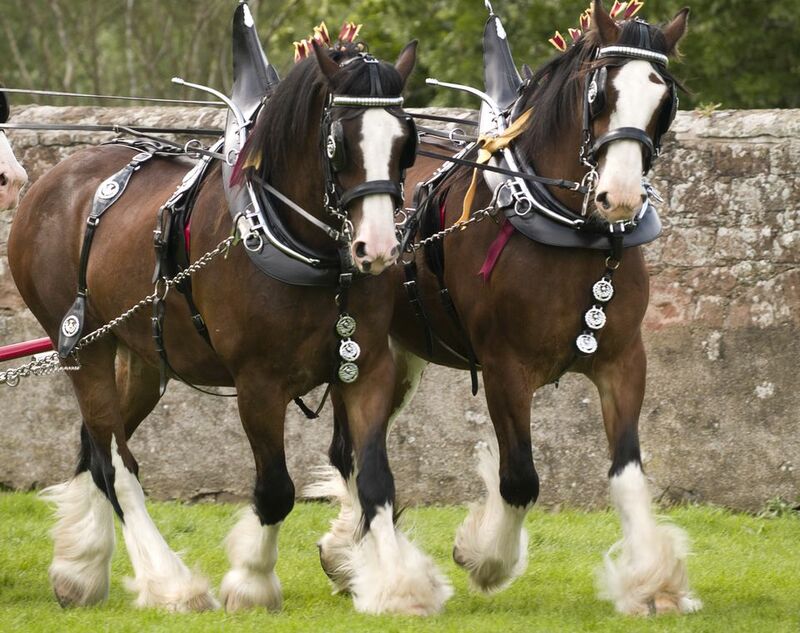 Is the Clydesdale Right for You? The stature of the Clydesdale is topped only by its easygoing disposition. These gentle giants make very good family horses. Early on, they were bred to ignore the noise and commotion of battle, so their descendants today are even-keeled and do not spook easily. Their intelligence and calm demeanor make them quite easy to train, and they make very capable trial horses. They're often described as happy horses who prance and play. As far as cost is concerned, you can expect to pay an absolute minimum of about $1,000; the average price falls between $2,500 and $5,000. A grown Clydesdale eats between 25 and 50 pounds of hay and 2 to 10 pounds of grain or feed every day—about twice as much as other horse breeds. They also need more room because of their size. A 24-by-24-foot stall is widely considered the minimum size for a Clydesdale who is turned out daily; a larger stall is required for one who makes less frequent trips to the paddock.